The next-gen 7nm AMD Zen 2 processor architecture is the brand new CPU design set to land mid-year in an AMD Ryzen 3000 sized package. These will also be the first 7nm x86 processors to hit the consumer market too… long before Intel can even get its own 10nm chips out the door. Zen 2 represents a brand new, unique approach to AMD’s processors and promises to really turn the screw on its Intel competition, both in terms of overall core-count and in its relative performance. It’s confirmed a mid-year release for the new AMD Zen 2 CPU design – which we expect to mean a Computex announcement – and has unveiled some of the architectural magic which promises to make the next-gen AMD processors the best the company has ever produced. These advances may also make them potentially the most advanced CPUs on the market when they launch. Along with the new 7nm process node, AMD is taken a modular approach, still utilising some 14nm silicon in the design to keep costs down and yields high. This new approach will allow the company to double the core density of the architecture, which could potentially mean 16-core chips hitting our desktops. Quite what we’d do with those extra cores in our gaming rigs, I don’t really know, but it would comfortably increase both the core-count and process node lead over Intel. 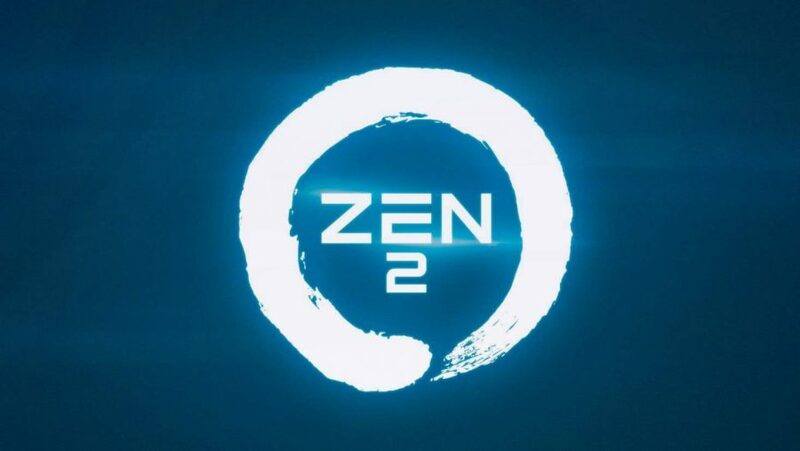 AMD isn’t stopping there, with the Zen 3 design already in the pipe, and ‘on track’ for a release sometime in 2020 on the 7nm+ node. So, if Zen 2 only has a year to live what can the next-gen architecture offer to make it a must-have processor for our gaming rigs? AMD confirmed at November’s Next Horizon event last year that Zen 2 processors had begun sampling, as promised, this year and is set to hit the market in 2019. Recent rumours have penned the first consumer chips for a Computex reveal and a July 7 release. 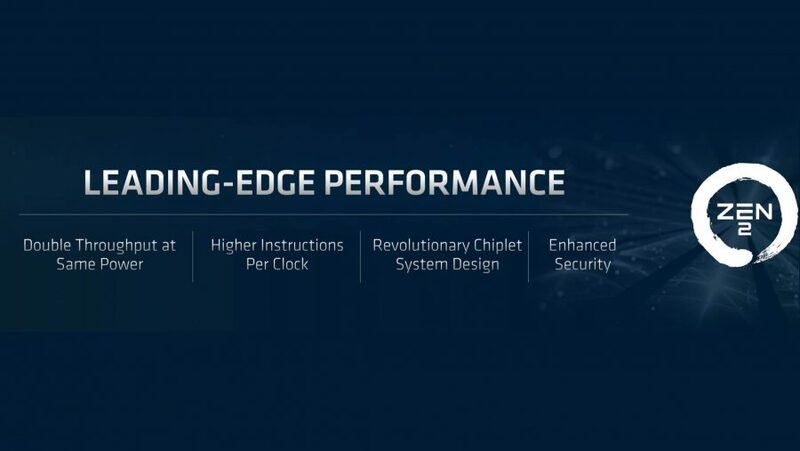 AMD’s marketing department is getting poetic again with the whole 7nm – 7/7 thing. AMD is introducing a new chiplet design, mixing the 7nm CPU silicon from the 14nm I/O chip. TSMC’s 7nm architecture alone allows for either half the power at the same performance, or more than 25% extra performance within the same power envelope, and AMD is promising up to twice the throughput of its last gen CPU. Early performance rumours have pegged the Zen 2 processors that are currently doing the rounds as delivering a 13% IPC performance boost over and above the existing Zen+ processors of the second-gen Ryzen range. That’s on a clock-for-clock basis, so with expected higher frequency chips that IPC hike could improve a good bit more. At the Next Horizon event AMD confirmed that it was bringing the Zen 2 processors to the market in 2019, with sampling of the early chips already in process since the end of 2018. 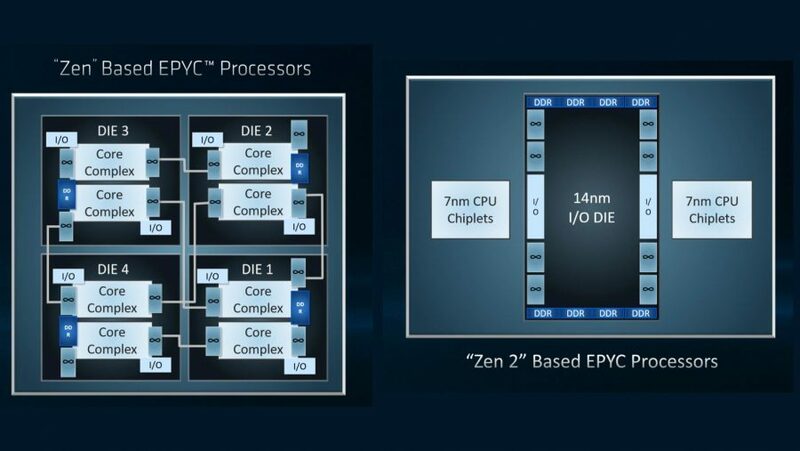 As this was a data centre event it was ostensibly referencing the next-gen EPYC Rome server chip, but AM4-based desktop Zen 2 CPUs are on the way, too. The latest rumours from Red Gaming Tech are suggesting that AMD is planning a joint reveal at Computex of the Ryzen 3000 series CPUs, sporting the Zen 2 architecture, alongside the 7nm Navi GPUs. Then it will have a joint launch on July 7. That’s mighty ambitious given the amount of new 7nm silicon such a joint CPU/GPU venture would require, but it also has a poetic ring to the 7/7 date too. AMD’s CEO, Dr. Lisa Su, took the stage for the keynote at CES in January, and the company announced that desktop 3rd Gen Ryzen processors would be on the way “mid-year,” which ties in with the latest rumoured release date. The good doctor is also set to take to the stage once again at Computex 2019. We expect big things from the inaugural keynote, and it is certainly going to be worth tuning into on May 27. As AMD has confirmed, it has already started sampling out processors using the Zen 2 CPU architecture. That means there are early engineering samples out in the wild, and the first noises we’ve heard about a desktop-based version has come from a September post on HardOCP’s forum claiming knowledge of a chip sent to AMD Radeon Technology Group. This chip is reportedly an eight-core, 16-thread Zen 2 CPU with a base clock speed of 4GHz and a boost frequency of 4.5GHz. Considering the top Zen+ processor of the second-gen Ryzen range, the Ryzen 7 2700X, has base and boost clocks of 3.7GHz and 4.3GHz respectively that’s an impressive start for an early engineering sample. 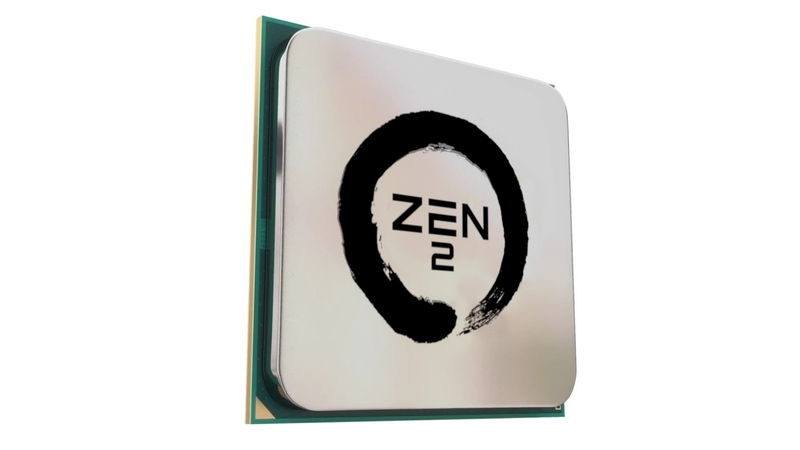 The first Zen engineering samples ran at 2.8GHz and 3.2GHz for its base and boost frequencies, before hitting our desktops as the 3.6GHz / 4GHz Ryzen 7 1800X. The fact that AMD is getting early silicon out of the fab and into the hands of testers and it’s running at speeds already faster than today’s best Ryzen 7 processor bodes well for the first Zen 2 launch chips. Though the forum entry does state that it was crashing. And crashing a lot. Given the 7nm lithography used in the CPU chiplets of Zen 2 it’s not a stretch to believe that AMD will be looking to produce final silicon that’s capable of even higher clock speeds. If it can match Intel’s 5GHz boost then the tables really could turn, with AMD potentially offering both more cores and higher performance. Just how many cores is still up for debate. 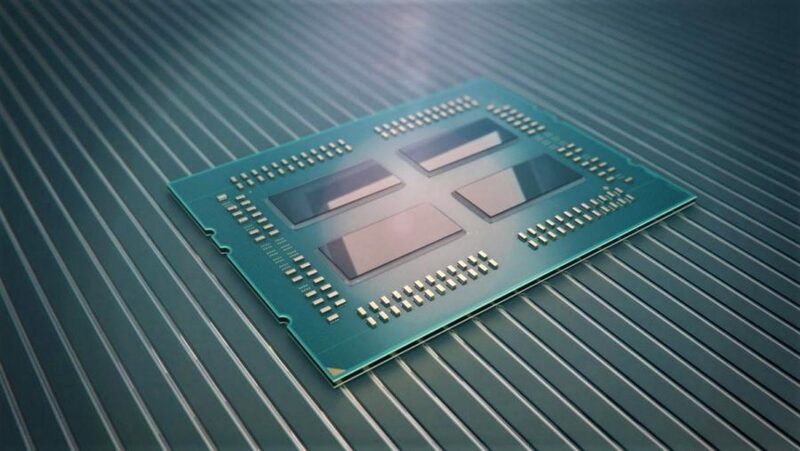 The new Zen 2 architecture means that AMD can double the core density of its processors – the new chiplet design introduced around the upcoming EPYC chips seems to indicate that AMD is moved from a quad-core CCX to an 8-core setup for its modular Zen 2 layout. Looking at the 64-core Rome chip you can see eight distinct modules, with each chiplet made of a pair of eight-core modules. On the shrunken desktop side, AMD will look to reintroduce its desktop core dominance over Intel by creating a two-chiplet, 16-core Zen 2 CPU to drop into the AM4 socket. On stage at CES, Lisa Su laid 3rd Gen Ryzen bare on stage and there’s plenty of space left for a dual chiplet design. The 14nm I/O die doesn’t need to be the same size as that used in the next-gen EPYC server chips and so is easily cut down to fit in an AM4-sized package. That will be serious overkill for gaming rigs, but will make monstrous video and content editing/creation rigs from relatively mainstream machines. Though might upset a few Threadripper 2 owners in the process. Though given the limited PCIe lanes on offer the X399 chipset will still be best for power users. The X570 motherboards are getting a serious bandwidth update with PCIe 4.0, but X399 will retain sheer lane dominance for platform devices. 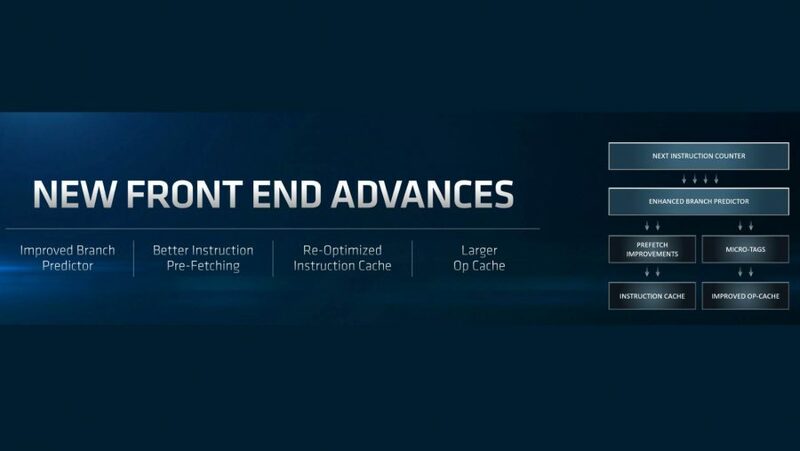 AMD has said it will be sticking with the AM4 socket through to 2020 – which means until Zen 3 according to the latest roadmap. The upcoming 3rd Gen Ryzen Matisse processors will be backwards compatible with older motherboards, although this will require a BIOS update. These BIOS updates have already started rolling out if you want to get prepped early. The biggest change for AMD’s Zen 2 architecture is the extension of the modular design introduced with the first Zen architecture. That layout allowed it to essentially create a CPU design that could be shrunk down for wee mobile SKUs and expanded to the desktop, and all the way up to the beefy 32-core EPYC server chips that we now have. Zen 2 takes that further, separating the actual CPU and I/O parts of the processor into discrete modules. 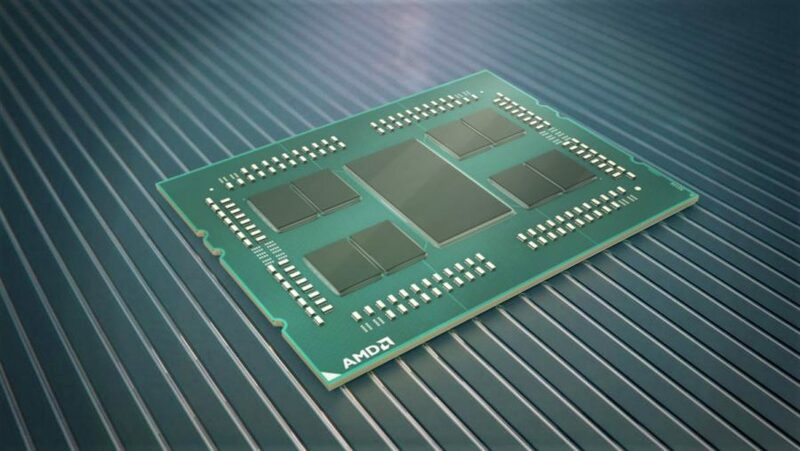 This multi-chip design means AMD can use individual 7nm chiplets to house the actual Zen 2 cores and connect them to a larger 14nm die looking after the inputs and outputs. 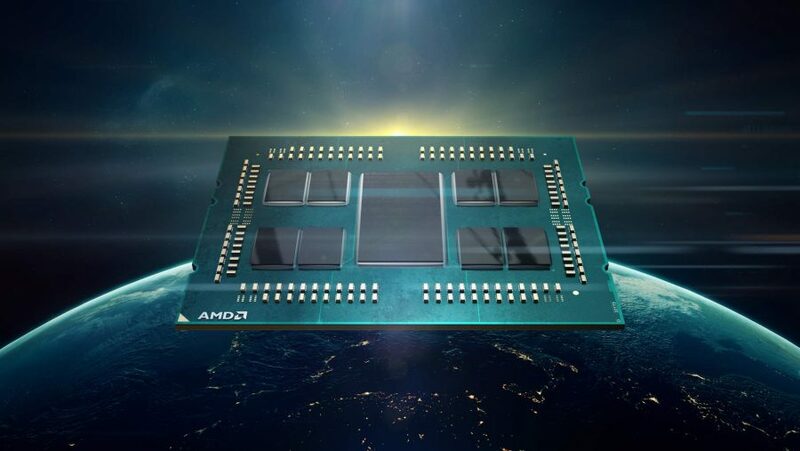 Separating it out means that AMD doesn’t need to shrink down the physical connections for memory and can use the mature 14nm process to deliver great yields, focusing the 7nm node on the CPU cores themselves. 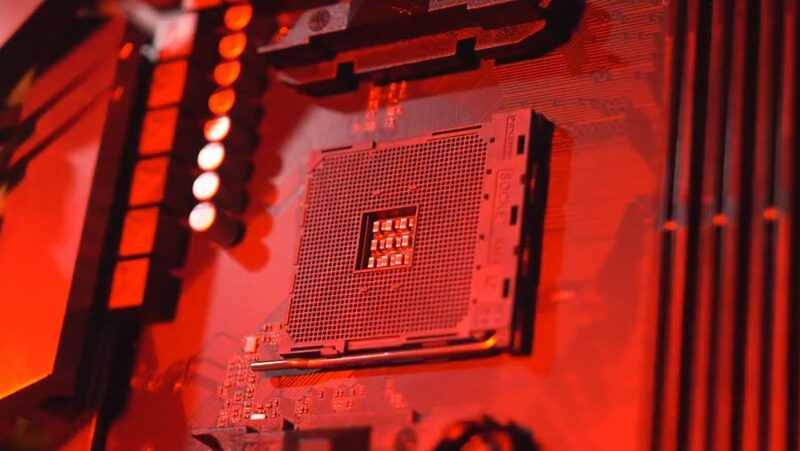 And by keeping those 7nm cores separate it allows AMD to more easily sort functional silicon and help keep prices in check for the expensive new lithography and it’s biggest, high-performance CPUs. It also means the 7nm chiplets can be smaller than the original CCX design of Zen – a 16-core pair of chiplets from Zen 2 looks a lot smaller than the eight-core silicon used in the first EPYC CPU. Centralising the I/O also means that – for these monstrous, many-core parts at least – each core has the same level and speed of access to your PC’s memory. With Threadripper, for example, the different cores sometimes had physically longer connections to memory, which is what gave rise to the ‘Gaming Mode’ feature. That cut Threadripper’s core-count in half to only use the cores with closest access to the memory. That won’t be a thing with the Zen 2-based version of Threadripper, but that’s probably no consolation to Principled Technologies. Though that’s not of huge interest to us PC gamers, what is more interesting is the promise of higher IPC from the new Zen 2 architecture. AMD is improving the front end of the Zen 2 CPUs, delivering improved branch prediction and pre-fetching, and boosting its floating point performance too. With the higher instructions per clock and doubled throughput within the same power envelope, the Zen 2 architectural improvements could potentially make a big difference to the overall frame rate performance of the chip. Combine that with higher clocks enabled by the more efficient 7nm lithography, and a potential higher core-count, the gaming versions of Zen 2 will be hard to beat. When it comes to desktop performance, AMD took to the stage at CES to show what the Zen 2 architecture has to offer. Versus Intel’s Core i9 9900K, an engineering sample of an eight-core Matisse chip managed to excel in both performance and power draw. AMD has also offered the ephemeral ‘double throughput’ claims and the standard TSMC 7nm mantra of around 25% extra performance at the same power. Needless to say, there are still some early rumours based around the pace of the new Zen 2 engineering samples. Bits and Chips recently tweeted out about the potential 13% average IPC performance boost being shown by Zen 2 in scientific tasks compared with the latest Zen+ processors. This was taken on a clock-for-clock basis, so with higher frequency chips – made possible by the 7nm lithography – that instructions per clock boost could be even higher gen-on-gen.
And that’s what could make the big difference this generation against the Intel competition. When Zen 2 launches on the desktop, Intel will still be running on its old 14nm Coffee Lake architecture. That does still offer an IPC lead over AMD’s current-gen Ryzen CPUs, which is largely what’s responsible for Intel’s traditionally better gaming performance, but when both Intel’s i9 9900K and AMD’s 2700X are run at the same clock speed there is less than a 13% delta between them. In single-core performance metrics the Intel chip only has a 5% lead, and when using all 16 threads it’s actually the AMD chip which pulls ahead. If AMD can manage to run its Zen 2 desktop CPUs at the same frequency level as the latest 9th Gen gaming chips then there’s no longer going to be any gaming lead for Intel to crow about.